We are all keenly aware of the current and very real unpredictability in our current political climate. Peter Fishinger covers six important areas of concern in his article "Advice for Nonprofit Leaders: How to Navigate an Unpredictable Political Landscape." Watch the economy first and tax policy second. Looking ahead, many analysis groups predict economic growth for 2017 and 2018, albeit at a lower rate than in previous years. The nonpartisan Tax Policy Center posits that if fully implemented, these (Trumps's) proposals could decrease giving by 4.5 to 9 percent. Let politics inform your work, but not define it. Find a way to harness this mindset by analyzing how new political leadership and trending activist movements motivate people. Organizations in some sectors are already showing success in responding to political changes. These include women's health, environmental, international, and social justice nonprofits. Position your organization to adapt to sector-sweeping changes, especially in healthcare. Backup plans for disruptions in government funding, the tax structure, or a recession can prepare organizations to weather challenges and take advantage of new opportunities. Nonprofits need to think critically about resources and partnerships that are most critical to sustaining and advancing their missions. If there is another recession, leverage close donor relationships. People tend to reduce the number of organizations they support before they reduce the amount they give to their top organizations. If donors believe in an organization’s mission, they will be more willing to stay connected and support it through thick and thin. Speak up for the value of the nonprofit sector at all levels of government. Though the charitable deduction has previously earned bipartisan support, maintaining that support will take the efforts of the entire sector, and all nonprofits should communicate why this deduction matters. Stay committed. Nonprofits can thrive under any administration. History suggests that the organizations that are effective and committed can survive and thrive under any administration. Times of unpredictability can increase stress levels. The Leadership Sanctuary's mission has been to support nonprofit leaders to be more resilient, develop focusing practices and build supportive community. We urge you to stay informed, continue rigorous self-care and stay connected. Let us know what is helping you through these unpredictable times. Generous givers are a must for a thriving organization. How can we nurture this trait and avoid burnout? In Adam Grant and Reb Rebelle’s article Beat Generosity Burnout, they outline in detail with fascinating research, how selflessness can lead to exhaustion, but being thoughtful about about how you help, when you help, and whom you help results productive giving and a meaningful happy life. The following are excerpts from their article and research. If you have a few extra minutes to read the full article, you will be encouraged and clearer about how to manage your own giving. “Research shows that across industries the people who make the most sustainable contributions to organizations — those who offer the most direct support, take the most initiative, and make the best suggestions — protect their time so that they can work on their own goals too. Being an effective giver isn’t about dropping everything every time for every person. It’s about making sure that the benefits of helping others outweigh the costs to you. Finding ways to give without depleting your time and energy. Reactive helping is exhausting, but proactive giving can be energizing. Prioritize the help requests that come your way — say yes when it matters most and no when you need to. Give in ways that play to your interests and strengths to preserve your energy and provide greater value. Distribute the giving load more evenly — refer requests to others when you don’t have the time or skills, and be careful not to reinforce gender biases about who helps and how. Secure your oxygen mask first — you’ll help others more effectively if you don’t neglect your own needs. Amplify your impact by looking for ways to help multiple people with a single act of generosity. Chunk your giving into dedicated days or blocks of time rather than sprinkling it throughout the week. You’ll be more effective — and more focused. Learn to spot takers, and steer clear of them. They’re a drain on your energy, not to mention a performance hazard. Acting entitled to people’s help. Claiming credit for success while blaming others for failure. Being nice to your face and then stabbing you in the back — or being nice only when seeking a favor. We are going to have to be on our toes in the upcoming year. The changing political climate is putting funding in jeopardy—expect federal legislative and regulatory changes to affect the nonprofit sector. Time to speak up, be seen, and get our voices heard. Fight back against cuts in spending that would hurt the public. Expand, don’t limit, tax laws that encourage giving. Engage in the debate on the Affordable Care Act. Respect the legal independence of nonprofits to allocate their own resources. Keep partisan politics far away from charitable organizations and foundations. Simplify federal rules and contracts. There's a lot to do, but don't forget to take care of yourself. You can practice mindfulness in as little as 15 minutes. In this hectic time of year when it can be hard to catch your breath or find space to accomplish all that's on your to do list; it might feel impossible to find some sanctuary. Can fit in five minutes of mindfulness? Start your day with a short simple period of mindful breathing. Don’t have five minutes? Try this three minutes meditation. What else can you do to ENJOY the holidays? Think ahead, be flexible, don’t overdo, be mindful of your intake, forgive yourself, stay grateful, do what you love! That’s one appraoch—what is yours? What strategy will suit your life-style, your family and bring your the most joy? Do you ever wish you could slow your mind down? Are you juggling too many thoughts or can’t get to sleep? 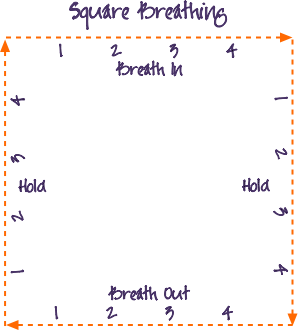 Try the Square Breathing Technique! This is a simple, easy, effective way to relieve stress and refocus your attention. Find a square or rectangular object near you; a picture frame, a door, table top, sidewalk square, fence, etc. Or picture a square in your mind’s eye. Move your eye from the top left corner of your box to the right corner, inhaling to the count of four. Move your eye from the top right corner to the bottom right corner holding your breath to the count of four. Move your eye from the bottom right corner to the bottom left corner, exhaling to the count of four. Move your eye from the bottom left corner to the top left corner, holding your breath to the count of four. Keep moving your eyes along the square as your slow your breathing. Breathe around the square for two to five minutes. If you wish, you may change the direction of your eye movement to counter clockwise. For added benefit add a statement of gratitude to each movement. Tip 33: You’ve Asked, But Are You Listening? You’ve had a pressing dilemma, asked for input from colleagues and peers, and posed the question to the universe. Are you taking the time in quiet reflection to hear the answer? It is helpful when deep listening is needed, to take time and make space for silence. This sounds simple, but many people avoid silence. There is no substitute for creating an environment of receptivity than a restful, undemanding session of quiet. Take as little or as much time as you need. Sit. Get grounded and settle in a comfortable position. Relax the body. Start with a moment of gratitude. Are you able to feel a sense of lightheartedness? Allow your perspective to shift to the issue at hand. Be in the question—what is the path to a solution? Notice any blocks or obstacles. Do not resist, just notice. Allow your heart and mind to be open to new ideas and inspiration. Worrying about what may or may not happen drains our energy and keeps us from living in and enjoying the moment. The next time you feel as if a worry will take over your mind, take a moment to relax and consciously direct your worry to float away. Let each worry float away as if it were a balloon. Give the universe the opportunity to step in and move the worries in another direction. As you detach your thoughts from each area of concern, allow your energy to return to you. Rest, and allow ease to fill your body. If a worry creep back into your mind over the day, write it down on a note card and tuck it away. Remind yourself to address this concern at the appropriate time. Briefly close your eyes, take a deep breath and feel your feet on the ground so that you can return your attention to the present moment. We get so tuned out to our environment when we take the same route, walk the same path. Next time you venture out, focus your energies on your surroundings. Switch out of auto-pilot and notice the new and different. What do you see? Feel the quiet connectedness of truly being in your surroundings. The warm welcome of spring invites us outside to walk, play, garden, party or adventure. It’s Spring—time to plant. Take a moment to plant your feet. Be. Where. You. Are. Mindful walking is a choice to be fully awake in the moment. It shifts our mental construct to being more aware, strengthens our concentration and connects us to the present moment and it's fun!